Yep….I’m still in LOVE with kimonos! I’ve been in the process of planning a beach vacation, and so I’ve been going through my closet to start gathering and putting together what I need to take along. I ran across this kimono and was reminded again that KIMONOS are one of my favorite things to take to the beach. 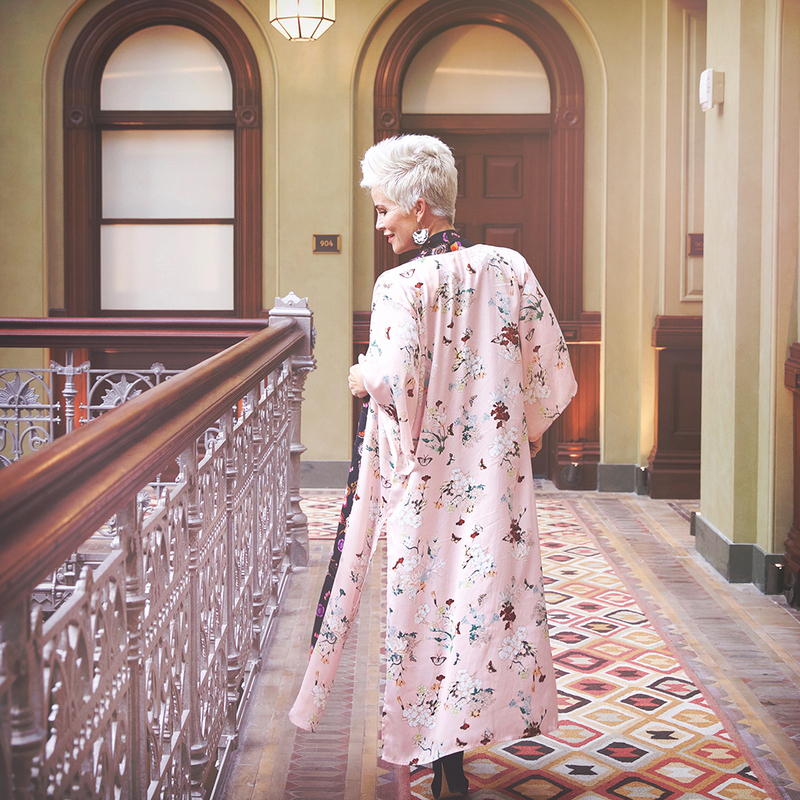 And so being in the middle of resort-wear season, I thought I would talk some about KIMONOS. This one is from a couple of years ago. I was in New York City shooting an ad for Loreal Skin, and staying at the swanky Crosby Street Hotel. It was absolutely gorgeous!!!! The kimono I feel, is still very much on trend and will be so beautiful on the beach. They are such a great way to cover up when you want to be out and about in a swimsuit. Flowy and loose and just so pretty over almost anything you want to wear! Put them on not only over your suit, but shorts, silky pants, a long tee-shirt dress or your jeans. Very versatile for sure!!! Kimonos come in all styles. Short, long, plain, or packed full of color and print! My favorite happen to be the long colorful kind! The ones I’ve linked up below, are the ones I would shop for right now! I love wearing them as well in cooler weather, with a lightweight sweater underneath and some booties! So if you’re thinking about a beach vacation or cruise or just a vacation anywhere, a KIMONO is a really great piece to pack in your suitcase!!!!!! And what better thing to wear on your special VALENTINE’S DAY date?! They have such a romantic vibe to them and I think one would be FABULOUS to wear! Have a great one friends! You look nice in the kimono. I am just not into boho style at all. Never have been. But the kimonos look good on other people. I just don’t feel comfortable at my age wearing that style. I would love to find one that hits me right about at about the thigh as I am 5’1″ and don’t feel any longer looks suitable. Any suggestions?